Posted: Wed 11 May, 2011 2:15 am Post subject: Re: "C.D. Wolfe New York"
Hi Jake, that's a nice sword. I would agree it likely a bit later than the 1812 conflict. 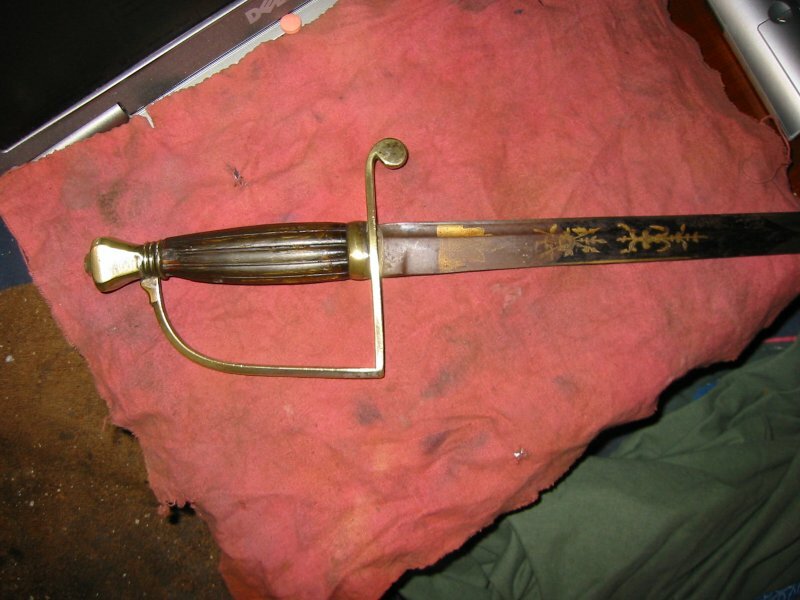 Attached below is a similar sword with blue and gilt instead of the etching. Is there any lettering on the spine of your sword? Thanks for the reply! That's a great looking sword. It's nice to see another Wolfe piece. Here's a picture of the spine. 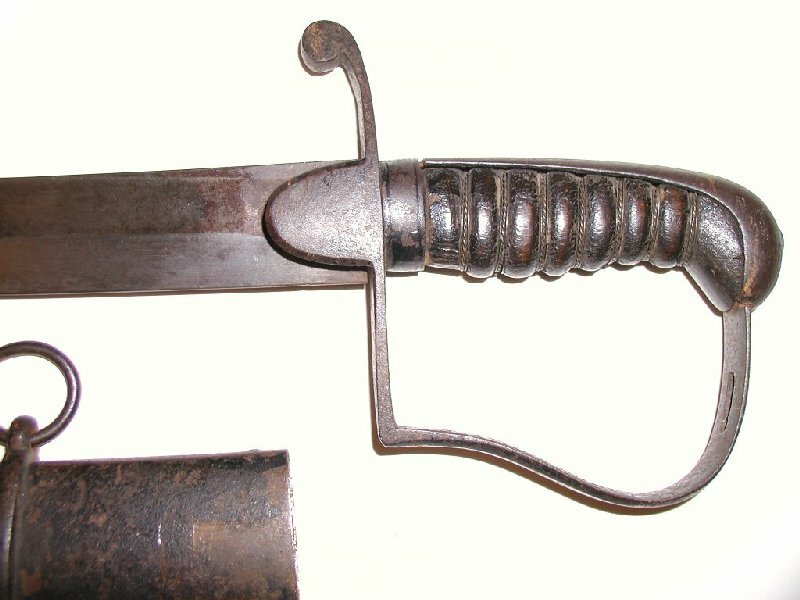 These Wolfe swords more properly belong in another ongoing thread here about 19th century swords. 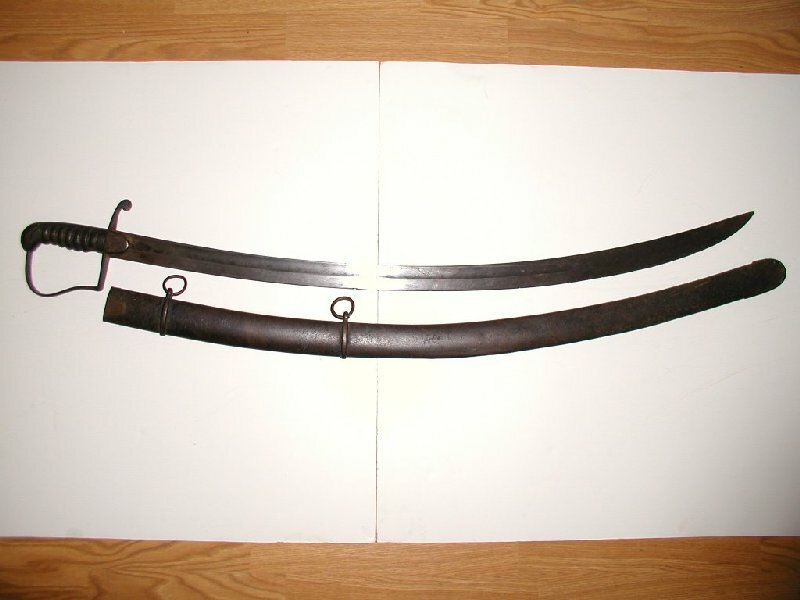 Here is another Wolfe sword that is out there for sale right now (not a bad deal for what it is). 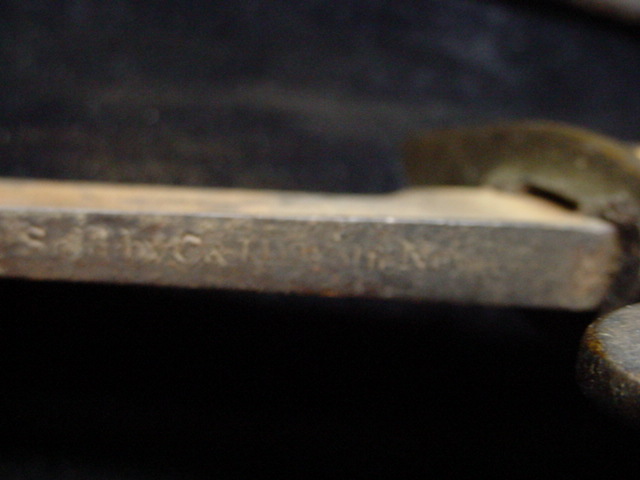 I have no hard early data on when an etching such as yours would have first started to appear. There are still a lot of gaps in written information for both families and it is only recently I have come to suppose there were two Adam Spies, two generations. I am attaching a couple of Spies marked swords much in the same fashion that somewhat supports my thoughts of two generations. 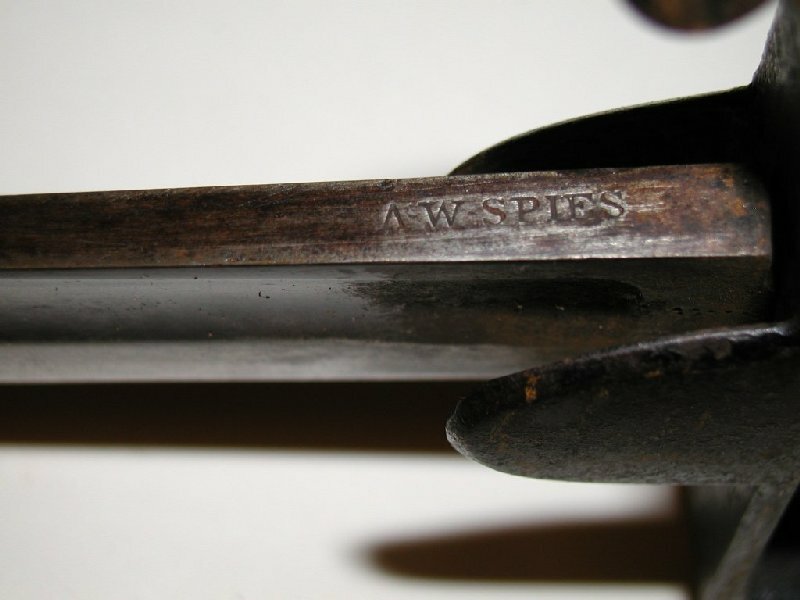 The later Adam Spies was a teenager when going to England to learn and work, so this one posted now was either by his father, or very early work sold by his shop. Biographies still very much still unraveled. I have some other Wolfe types archived as photos and had/have been working on Spies from the beginning of my interests of the American Eagles. I had pu some Spies information together in this thread elsewhere. More escaping me in other drives or folders at the moment but I have some other examples of Wolfe types and marks somewhere. Ah, here is the Wolfe eagle and I may have another pattern here in another folder. A blue &Gilt Ketland type, definitive also of Birmingham. What would you call the sword immediately above? It's almost but not quite a pillow pommel. 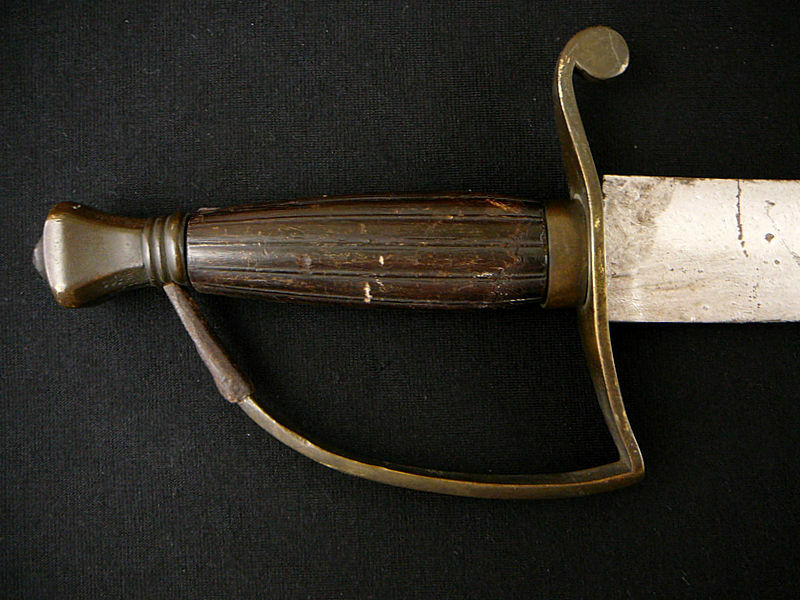 I've seen these labeled as NCO swords--but with that decorated blade I'm thinking it would be an officer's sword. Actually very much as I wrote in the second paragraph above the pictures. The nco short sabres are probably the most numerous we see out there. I was looking in my files for a Wolfe marked one and have buried it somewhere. 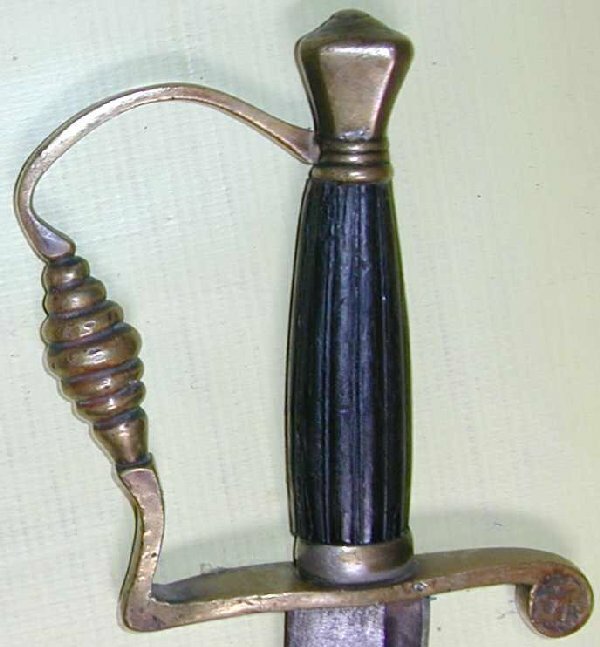 The pommel might be better listed as an urn and these simple hilts do show up on officer grade swords as pictured above. It is the same with the spadroons but all I have seen as spadroons have been officer swords. My silver plated job is one of those quite possibly put together in the colonies as it is a German looking blade. The hilt form though seems to be quite English. I am having a real nightmare this week with my folders and remembering where stuff is but here is a plain jane one but not the file I have with the New York mark. My spadroon has made an appearance earlier in this thread and others. Both eagles and these other forms come in plain or more frosted for commissioned officers. I have a Wolfe urn nco somewhere, just not where I am expecting to have put it. I may never have saved the one I am thinking of as so common and marked to Wolfe. Oh and one more for you Tom from Snyder's pages. One of the first time I saw these urns but this bee hive of teapot look always sticks in mind. Thanks much for all that information with photos! It might be time to add a nice spadroon to my collection. 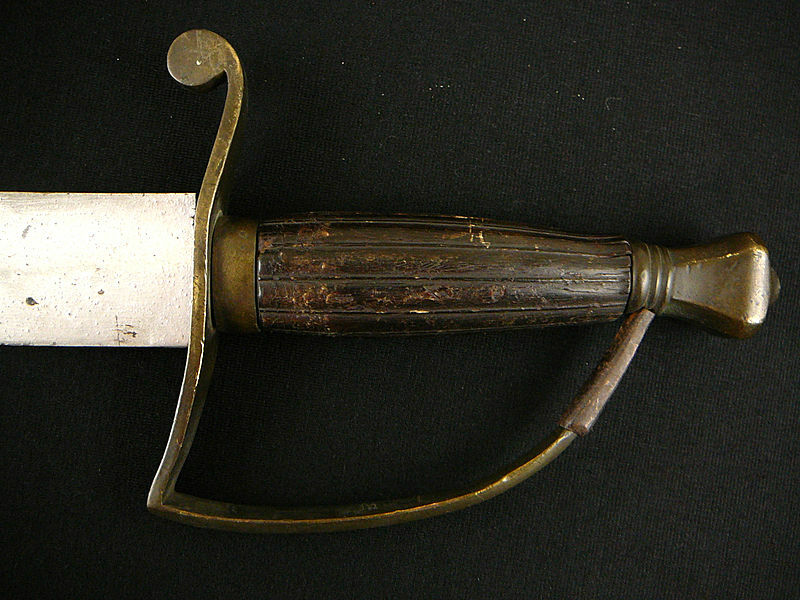 That's a nice sword--I have always found the straight-bladed swords of Persia, India, etc. to be quite interesting and rather beautiful. Thanks Tom. I'm still not clear yet if these swords were ever actually used at the time, or were only for ceremony. 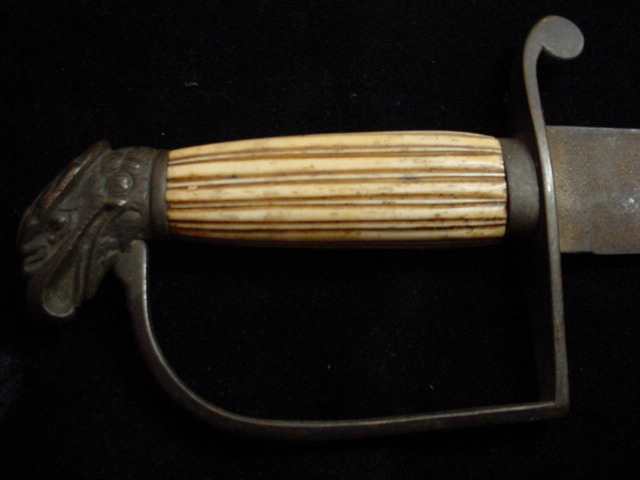 Mine at least seems made for use -- it has a sharpened wootz damascus blade with good temper. I imagine if they were used, they corresponded to the pallasch-type swords of European cavalry at the same time. I recall reading that during the early crusades, the crusaders were met by an enemy armed with straight bladed swords like their own. Popular presentation of the crusades (such as movies) ignores this fact and the west is armed with the cross shaped straight bladed sword and the east with the crescent shaped curve bladed sword. So that's one slant on it. Your sword is very nice. If you can manage, how about a close up of the hilt and blade? Here's the hilt (photo is published in my article mentioned above); you can see the blade's gold overlay a bit better, but the wootz pattern is difficult to spot. Yes, the idea that there are "Islamic" weapons which are categorically different from "Christian," "European," or other classes of weapons is one of my greatest annoyances in the historical study of arms. I allude to this in my article also. It simply doesn't fit the evidence, and I wish people would stop saying it. I think this is a servicable sword, Ruel. Not meant for ceremony. 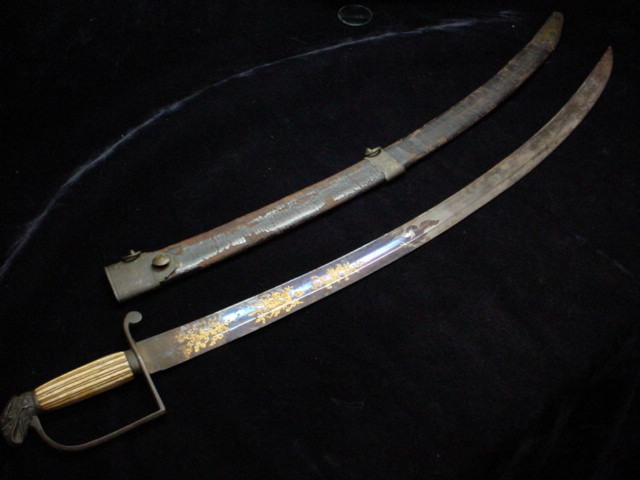 It is distinctly different (from what I can tell by the photos) from those swords of this type with flimsy etched blades of a soft steel (or even just iron). This "ceremonial" type turns up on eBay now and then. The wootz steel, good temper, and sharp edge do speak to usefulness, though the thinness of the blade makes it rather whippy. However, I've never seen this sword type depicted in period art as might be expected. The strongest argument for actual use is indirect, by analogy to the adjacent North Indian horsemen of the same time. 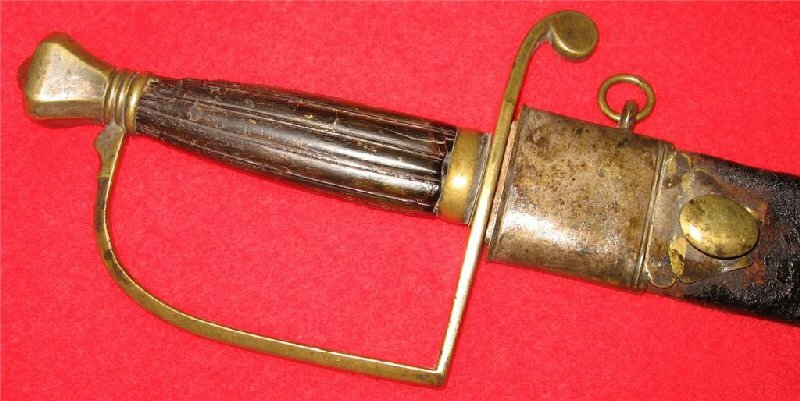 Rajput cavalry, for example, are known to have still used the straight double-edged sword (together with the saber) in the 18th century. What's interesting is that the swordsmen in India who worked with gauntlet swords had a whippy blade and they were considered highly skilled swordsman for their very ability to manipulate such blades. So I am not sure that the whippiness of it would disqualify it from being an arming sword. With any luck, we may have some answers this weekend. A friend of mine working at the local Renaissance Faire is re-strapping the armor plates for my costume corresponding to this sword. If he finishes it on time, I'll probably wear the armor and helmet there (never mind the anachronism -- 18th to 16thc), bringing this sword and a mace along as arms. If that's the case, I'm sure I'll find some excuse to test cut with the sword, and will report back on the results. I recall reading that during the early crusades, the crusaders were met by an enemy armed with straight bladed swords like their own. 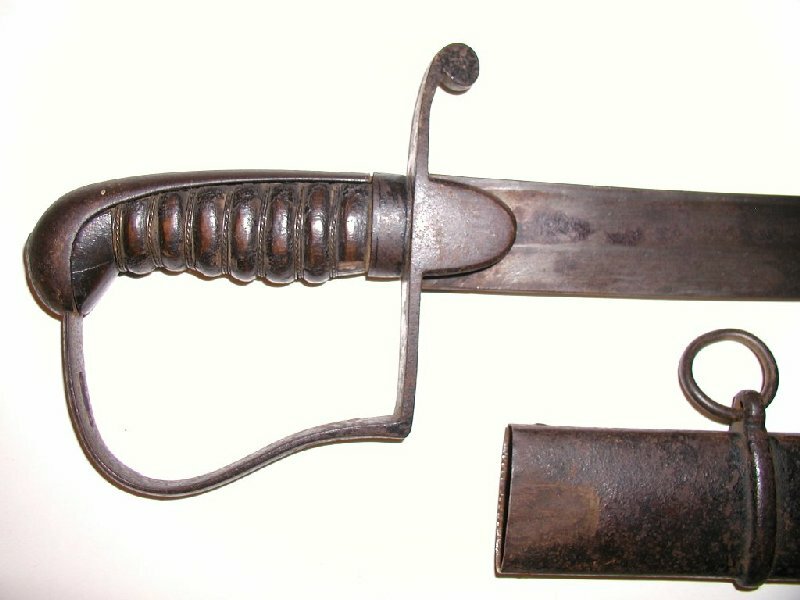 I recall seeing one example in a book with a canted grip and straight blade, described as an early Islamic sword--it reminded me of a straight bladed sword of the earlier Polish or Hungarian mounted warriors. BTW: Morgan, I am really getting into the Hungarian and Polish experience with swords/sabers--fascinating. I am reading about the siege of Vienna and the rescue (more or less) by the eastern Christian warriors. If you're interested in the 1683 Ottoman siege of Vienna, you need to read Almond 2009 ch.4 -- it corrects the false perception of that campaign as "Christian vs. Islamic" or "European vs. Oriental." More than half of the troops on the Ottoman side were Christian! In fact, Hungarian Protestants were the ones who asked for Ottoman help in the first place, because of oppression from Habsburg Catholics. http://www.forensicfashion.com/PositionStatem...tions.html , s.v. "Ottoman Turks"
I read that the armoury in Vienna has a great collection of arms captured during that conflict--is there any way to see some of those on the web? i had some turkish muskets photographed and posted in this thread.